The 4th Annual Festival of Meats and Bacon Celebration draws near! RSVP to the awesome event at https://www.facebook.com/events/436555989721951/. The Albany Society for the Advancement of Philanthropy is a local non-profit organization dedicated to helping groups and individuals in the capital region. This year ASAP will be awarding a $500 dollar scholarship to a high school senior (male or female) who is planning on attending an Albany college or university. The essay should be free form, and should in some way convince ASAP that you deserve to win our competition. Creativity is encouraged. Deadline: essay must be received by April 1. Magic Hat and ASAP Team Up for Mardi Gras! Saturday, February 18th, 2012 from 12noon to 6pm on Lark Street in Albany. What is happening? We will give each team questions and you will have to visit a number of bars in and around Lark Street to answer the questions so your team can get points. You will also “do what you have to do” to get beads. You REALLY REALLY REALLY wanna get beads. We are starting at Lionheart at 12noon and finishing at Lark Tavern at 6pm. You will have until 5:30pm to gather all your answers, gather beads, and then your team will head to the Lark Tavern for the prizes, the highest scoring team will get $1500!!! Runner up will win a trip to the Magic Hat Mardi Gras in Burlington, VT, March 2-4, 2012!! During the day and at the Lark Tavern you can also buy special Magic Hat Mardi Gras beads to benefit the PAWS program at the Albany Damien Center. There will be $100 prizes for: Wildest Outfit, Most Beads, Best Team Name. What can you do? You can get a team of people together, a team can be 2 people minimum and 10 people maximum. $5 per person is all it costs to be part of this fantastic event! Cash, Check, or Credit Card will be accepted for registration starting at 12noon at Lionheart. PAWS (Pets Are Wonderful Support) is a program of the Albany Damien Center that provides care and support of the animal companions of people with HIV/AIDS. The program is all volunteer and counts on good people like you for support. Join us and all the other fun people this Saturday. Good fun for a good cause. The 2011 ASAP Fall Ball is Next Friday!! Congrats to our newly elected 2012 Board of Directors! I feel an awesome year is just around the corner, and it will be tough to top 2011 for sure. ASAP and the ASAP Daisies elected their 2012 Board of Directors last night, and here are the Gents that will be leading the charge in your ‘relaxing and encouraging’ philanthropic endeavours. Would you like to meet them? Well come to the ASAP Fall Ball and high-five them in person and get your photo opportunities. It’s back and better than ever! 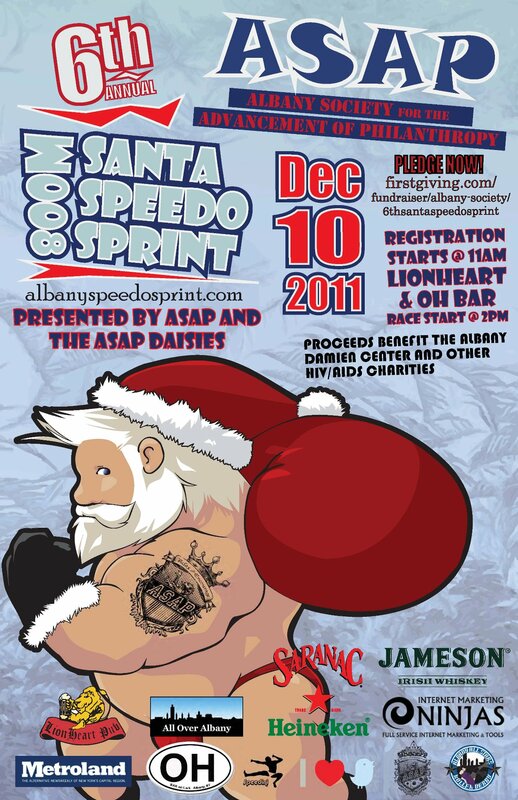 Join us for the 6th Annual Santa Speedo Sprint on Lark Street, Saturday December, 10th. Check the official website for more details and then hop on Facebook and RSVP to the event. Last year we raised over $25,000 for a great cause, help us make 2011’s contribution even greater! Ice cream and charity, how sweet it is. Come and check out our Celebrity Scoop event at Cold Stone Creamery! 15% of all sales will benefit the Santa Speedo Sprint and the Albany Damien Center. Come and support your favorite team! Come out for ice cream, good times, and a great cause! The fun starts up again tomorrow, Sept. 22nd at 7:30pm at the Washington Armory! Bring yourself and some friends… $10 for guys, $5 for girls. Check this link http://www.albanydodgeball.com/ for more details or look us up on Facebook. Join us Saturday, September 10th at the Elk’s Club in Albany for a day devoted to all things meat. Suckling pig, steak, clams, pulled pork, and more…even deep fried Twinkies for your sweet tooth. Also we have $10 raffle tickets for a chance to win $500 worth of meat from Falvo’s Meat Market! Check out our Official home on Facebook to RSVP and get more details! Welcome, to the new http://albanysociety.org! I’m happy to announce the launch of the new ASAP website! This website is linked to our official Facebook Page so you can stay up-to-date with all things ASAP in one way or another. There’s not much content here to see just yet, but the site will be updated regularly from this point forward. The Members Page is currently being updated and other content will be flowing in as well. We currently have some awesome events planned this Fall and Winter, keep an eye out for more info soon and we hope to see you there. This Fall ASAP will once again be voting for it’s Member of the Year. To help get you excited for this year’s vote, check out our voting and testimonial video for our 2010 MOTY, former ASAP Presdient Mr. Stephen Kervin. Congrats to the newly elected members of the 2011 Board of Directors! 2011 looks like a bright year for ASAP, congrats to the new Board as well as the newly elected ASAP Daisies Board Members. Congrats to President Stephen “ThrillHammer” Kervin on being voted 2010 ASAP Member of the Year! Lots of hard work and awesomeness was put forth by the Pres. and this award is well deserved. Check out the awesome MOTY video created by Jasen VonGuinness here.